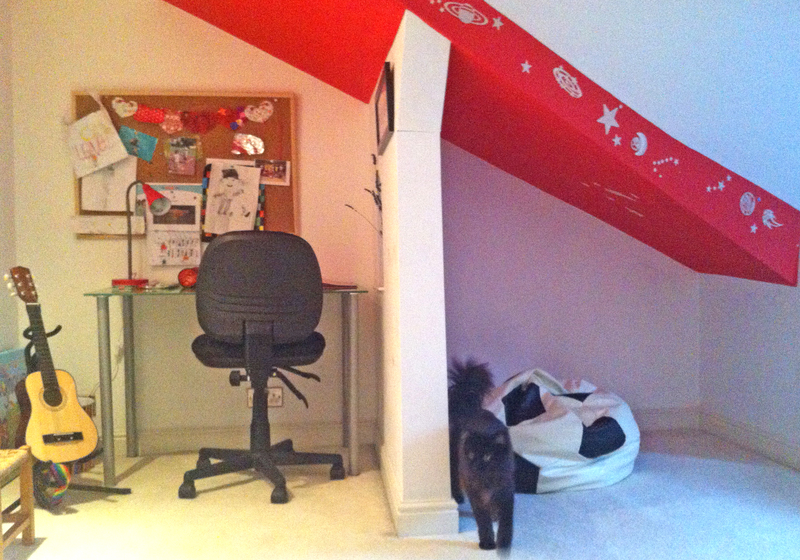 Caspar loves his room at the top of our house. It has a view of Beetham Tower (tallest building in Manchester where the Hilton Hotel is based) and also our local Subway (as in the sandwich shop). Two things very close to a 7-year-old’s heart. 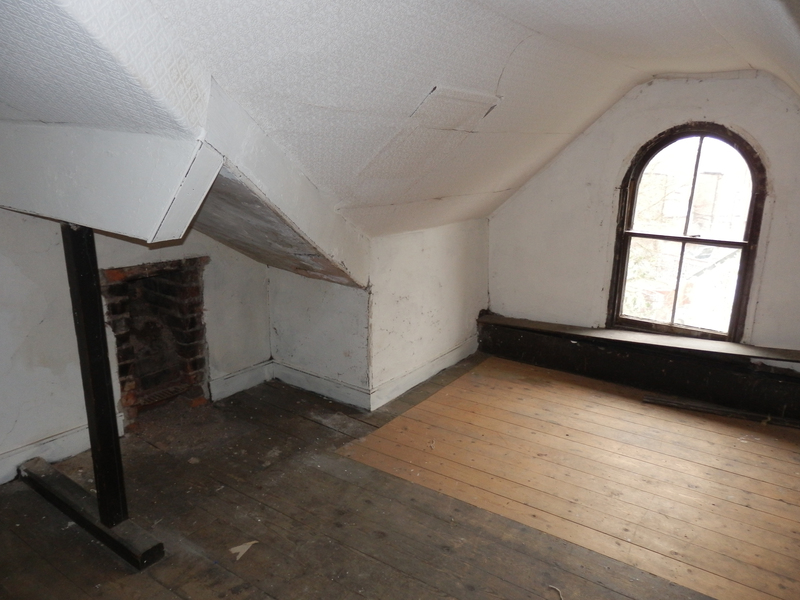 When we first bought the house, it wasn’t really a room, more of a loft space with dodgy dusty floorboards, moulding sagging walls and head-crunching beams. Not having quite grasped the concept of house renovation, Caspar seemed a little dubious about the deal he’d been handed, since his brothers clearly had more room-like allocations with mod cons like carpets and ceilings. 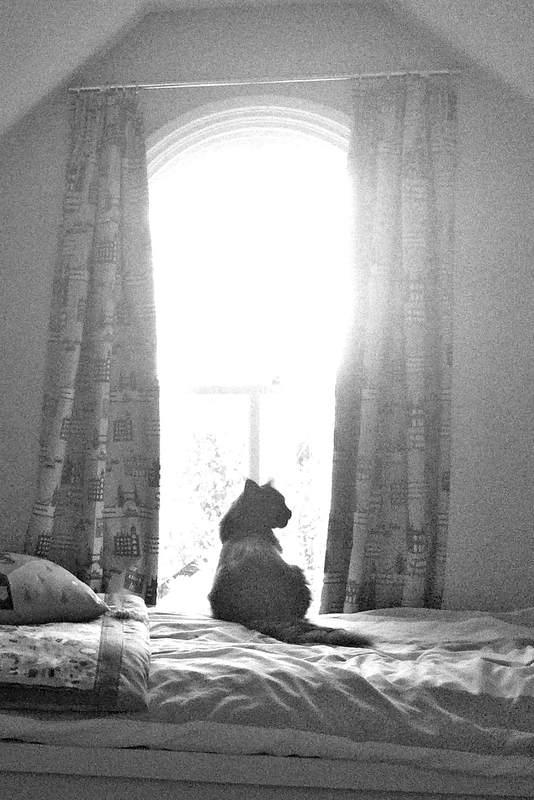 Still, as he mournfully confided in me one day, the view was good. 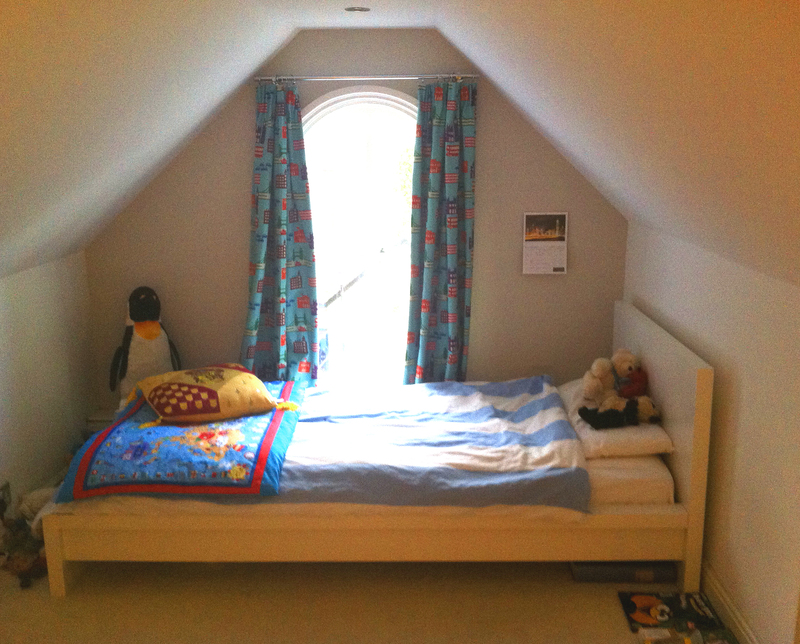 To his great surprise, we did in fact insulate, carpet and generally comply with building regulations so that by the time we moved in, he had managed to bag himself possibly the best room in the house. Tucked out of the way, with huge cupboards, interesting corners and the sweetest arched window, it is a place to hide, dream, play and potter. Perfect Caspar territory. The footprint of the room is L-shaped, if you follow the line of ceiling which accommodates head height. Then on most sides the walls slope down, making potentially awkward eaves sections. Added to this the structural beams jut out at odd angles. My first challenge was finding a place for the bed. Because of the funny arrangement of beams and ceiling slopes, I needed it to be tucked away and out of the main optimum head-height walkway area. Despite the fact it looks so small, the window wall is in fact perfectly wide enough for any single bed, with room to spare. While we’re here, I’ll just draw to your attention the curtain fabric, which ended up informing the paint choices. Caspar saw this one as I was trawling through websites for inspiration. 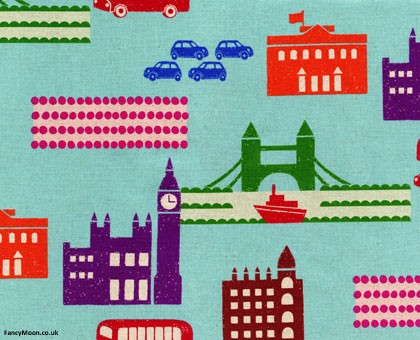 Fancy Moon has some spectacular fabrics from Japanese and American designers which I was particularly fond of, for their quirkiness and their cheerful innocence. I think so many of them are perfect for a child’s bedroom. Why not take a look at their website and see what you think? 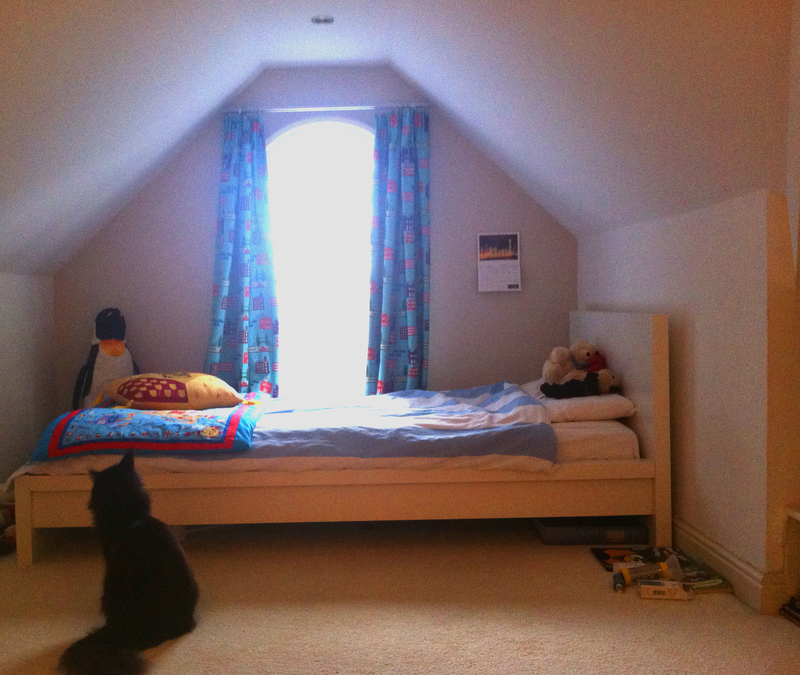 In previous houses the kids had all shared one room, piled into bunks, so we did need to actually buy a bed for Caspar’s new-found free space. I wanted to ensure that it didn’t stand too high, as the window frame is quite low to the ground and it would have been sad to obscure the arch too much, especially since this is the only source of natural light into the room. After some extensive size searches on all the affordable options, I found, satisfyingly, that good old Ikea came in the lowest with its Malm series. Low bed, low price. Having taken care of the sleep space, I assessed the rest of the nooks and crannies for their storage and access potential. The huge under-eaves space along from the entrance to the room seemed to be ideal for storage, and the fireplace wall looked good to put a desk for a study area. 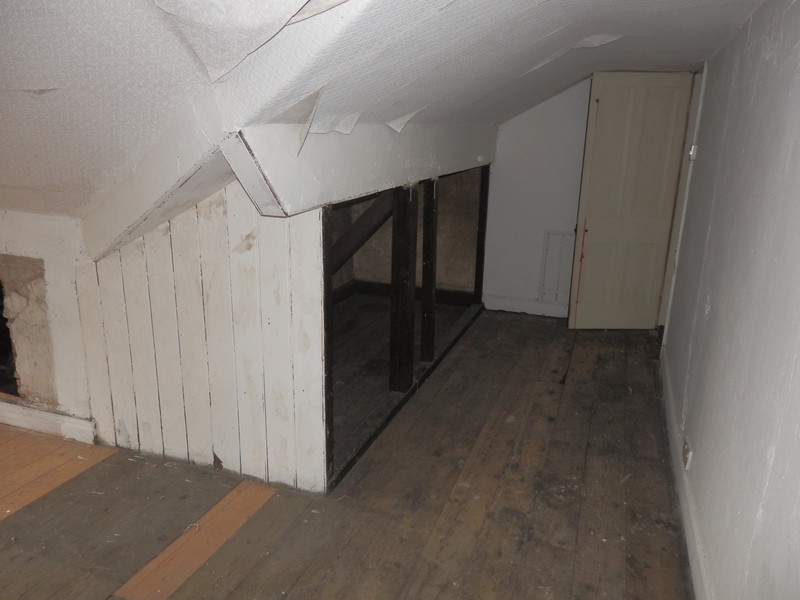 The beams on that wall were annoying me though: I was aware of the potential trip and bump hazards they presented, and yet we didn’t want to simply strip them out… just in case they were holding up some element of roof. Then we came up with the idea of filling it in, and creating an actual partition. It’s only made of timber, but neatly sections off the two areas. We even added in a peep-hole (arched like the window) to add interest. Owing to the aforementioned small window, the corridor section is gloomy even on a summer day. But we have put in LED spots to the ceiling, so that once the lights are on, it’s all bright. We chose a light-coloured carpet for the floor to reflect any rays, and I wanted to keep most of the walls white for the same reason. 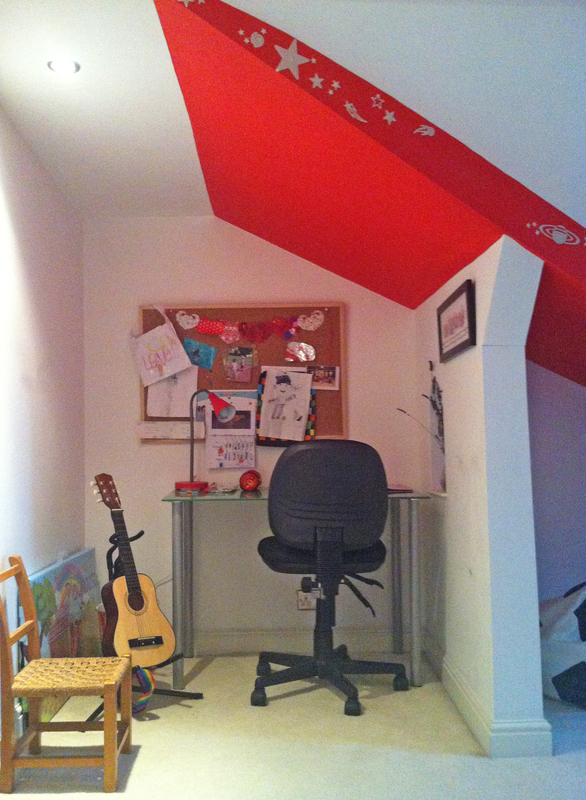 However to add some interest, I chose some chunks of wall and ceiling to paint bold colours. Using the curtains as a guide, we identified the RAL (colour code chart) numbers of a striking scarlet and a deep violet. 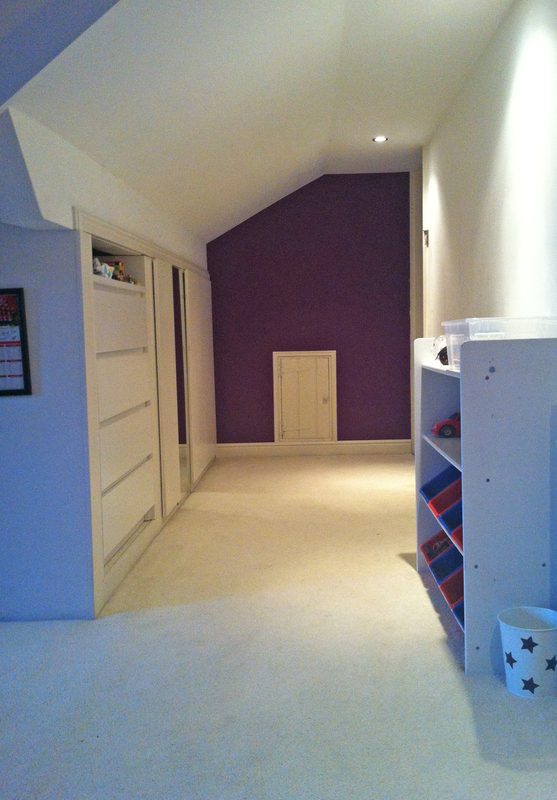 Above the desk and reading areas is the slash of red ceiling, and then, a few metres facing, by the door, is a bold wall of purple. The tiny door in the wall is not as exciting as it seems: simply an access point to another roof space, currently undeveloped. But the white woodwork strikes a great contrast and makes the room feel full of secret exploration potential. I am going to save my bespoke storage system until next time, so that we can really focus on the detail. 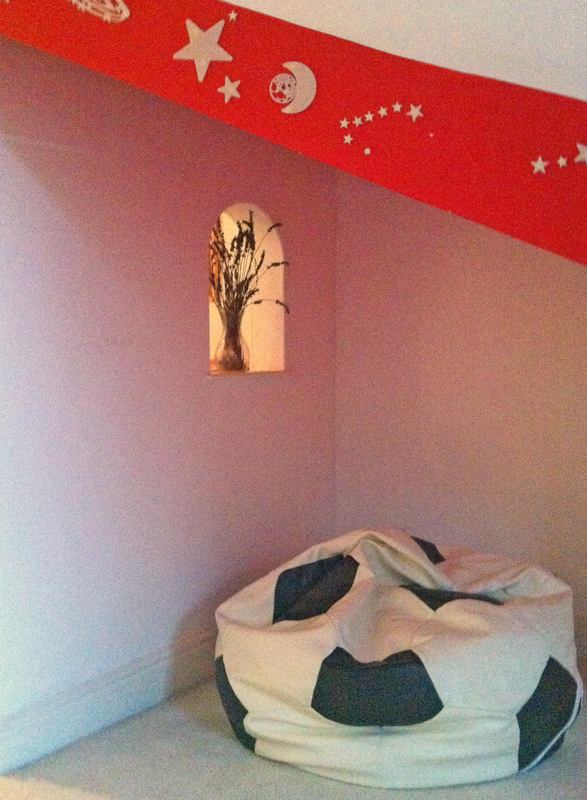 Until then, what do you think of Caspar’s room? Would you tend to rip out unusual elements in your house, or make a feature of them? You’ve done a great job of creatively using the space. I think all kids would love those interesting zones. You have a lucky boy. Thanks! It’s always lovely to hear what others think!